If you're like me and millions of other East Coast dwellers this weekend, you're snowed in. Restaurants, if you can walk to them, are probably closed. Markets are closed and completely wiped out of food anyway. In short, you gotta make do with what's in the fridge. In the days leading up to this weekend's big storm, we stocked up as best we could, but I also view this as an opportunity to clean out and use up a few things that might have otherwise gone to waste. Take today's lunch. Feeling like something other than a peanut butter & jelly sandwich, I looked through the fridge to see what odds and ends might yield a decent lunch. 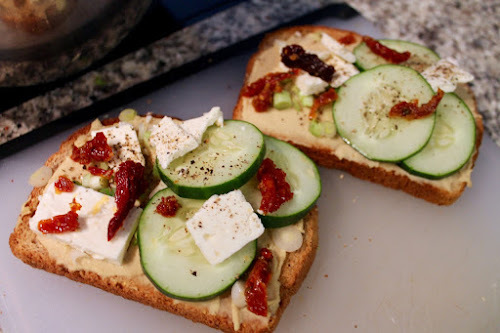 I found half a cucumber from a salad I made earlier in the week, some celery and scallions left over from kung pao chicken, half a block of feta cheese from last week's salad, my husband's mostly empty tub of hummus and a almost-empty jar of sundried tomatoes. 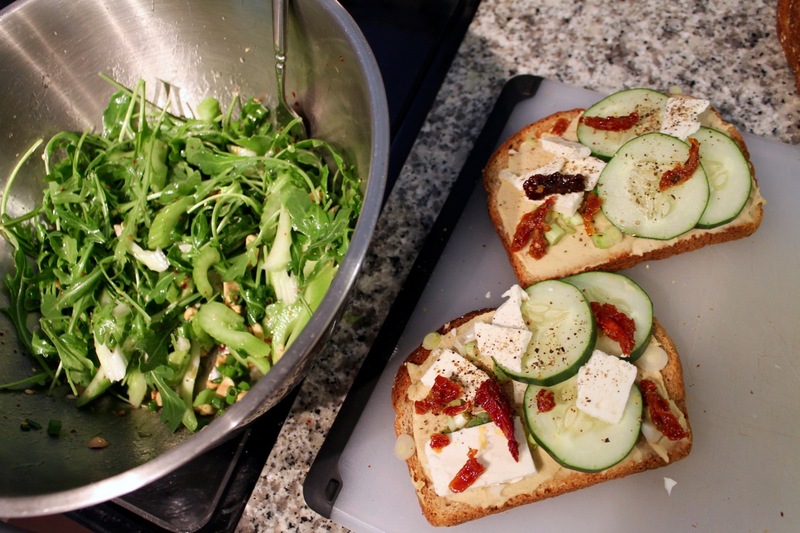 Together with a few new items--a fresh loaf of bread, a tub of arugula and a few other condiments and seasonings--I turned this motley crew of scraps into a delicious vegetarian lunch, a cucumber, hummus and feta sandwich and an arugula, celery and peanut salad, both of which were quite tasty. Toast the bread, then spread two slices with a generous 1 to 2 tbsp. of hummus. Top with scallions, slices of cucumber, crumbled feta, sundried tomatoes and a sprinkle of freshly ground pepper--plus the other toasted slices of bread. 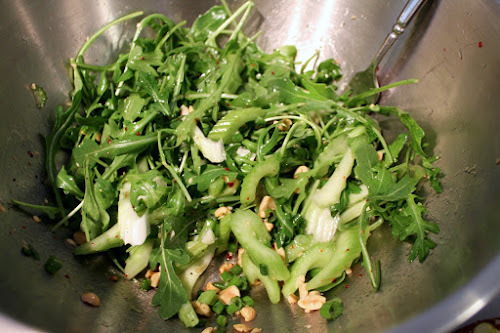 Combine the arugula, celery, peanuts, scallion and Aleppo pepper in a large bowl. Whisk together the other ingredients, pour over the salad and toss to coat with the dressing.